IBPS Clerk Recruitment 2018: The Institute of banking personnel Selection has been released an official notification regarding the IBPS CWE CLERK-VIII Exam 2018. There are total 7275 vacant places available for the Clerical cadre posts in the IBPS. The dates in which the IBPS Clerk Recruitment 2018 Online Application From are available from 18th September to 10th October 2018. The selection of the candidates will depends on their performance in the IBPS Clerk 8 Recruitment 2018 Exam followed by the online test. The IBPS CLERK Pre Exam 2018 will be held on 08.12.2018, 09.12.2018, 15.12.2018, 16.12.2018 and the IBPS CLERK Main Exam on 20th January 2019. The applicants need to pay Rs. 600 for General and Rs. 100 for ST/ SC Candidates. xamination this year in December month. If you are searching jobs in Banking sector then you have great opportunity to get employment. IBPS going to conduct Clerk examination to recruitment huge number of candidates in all over India. You good chance to get Job opportunity because their have no interview after Clerk Examination. You must be aware about all important things like Educational Qualification, Age limit, pay scale, how to apply process, exam center, selection process etc from below available details. IBPS Clerk Vacancy 2018 Academic Qualification: Applicants should need to be graduated from a recognized university. Candidates‘ Nationality: It is must compulsory that Applicants should a citizen of India. For other like refugee from Country like Nepal, Bhutan, and Bangladesh will allow to appear in clerk examination when they have the permanent intention of settling in India. Availability of Admit card for Pre Exam Training: November 2018. The graduated candidates are invited to apply for the IBPS Clerk 8 Recruitment 2018 by submitting the online application form on or before the last dates, i.e. September 2018. This time a huge no. of vacancies has been released by the IBPS for filling up 7883 vacant places available for the Clerical cadre vacancies to recruit the selected candidates into various banks all across the country. The applicants will be able to apply online for the IBPS Clerk Vacancy 2018 from 12th September 2017. Check Notification and check your eligibility criteria before applying for IBPS Exam. Read the IBPS official Notification. Go through the complete eligibility norms. Those who satisfies the eligibility norms in all aspects can apply by clicking on “Apply Online”. Fill all the necessary details in the IBPS Recruitment 2018 Online Form. Pay the application fee of Rs. 600 via net banking or debit card, credit card or bank challan. Upload the latest scanned photograph and digital signature. After rechecking all the enteries, click on submit button and take the print out of the IBPS Online Application Form. IBPS CWE-VIII Exam Pattern & Syllabus 2018: The IBPS CWE-VIII Pre examination is totally a computer based online exam. The IBPS Clerk-VIII CWE 2018 Online Exam comprises of 100 questions & the maximum time allotted for these 100 questions are 01 Hour and each question carry equal mark. IBPS Clerk-VIII Main Examination is categorized into 05 different sections, each section consists of 40 questions. There are total 200 questions, the maximum time allotted for solving these 200 questions are 02 Hours. 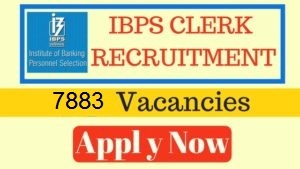 It’s a great opportunity for all those who are searching for the clerical jobs in banking sector, this time the Institute of banking personnel Selection has released 19243 vacancies for the post of Clerk to recruit them all across the country in various banks. The apply online link for the IBPS Clerk Recruitment 2018 will be activated from August 2018. The online Applications for the IBPS Clerk 8 Exam 2018 will be available on its official website, i.e. ibps.in till September 2018. The IBPS CLERK 8 Pre Exam 2018 will be held on 02.12.2018, 03.12.2018, 09.12.2018 & 10.12.2018. After that the IBPS CLERK 8 Main Exam 2018 will be conducted on January 21st, 2019.